I recall riding my bike up to my dad’s office to meet him so we could walk over to the Inn to attend the annual Rotary father and son luncheon. Back then, I didn’t know the Roycroft as an historic place, all I knew was that there was something about the buildings and grounds, the peristyle that floated above us as we approached the entry, the over-sized oak door we opened, the volumes of interior space that unfolded as we passed, captured in light and shadow, tinted by stained glass, trimmed in wood. Later on my ride back home, the Village streets and sidewalks, yards and trees, houses and porches, reiterated similar qualities, and together, wove a delicate, complex, composition of elements that helped shape the experience of what it was like to grow up here. It instilled in me a desire to draw and paint, and later, to study and practice architecture. I spent many hours working in and around his office building over the years and I recall looking closely at the statues across Main Street on the front lawn of the Middle School from time to time. There was something about them. Finally, one day I bought the materials I needed and began work in my studio. The twelve-step lost wax process, see CASTING PROCESS page, describes a long, amazing journey, and an incredible experience for me personally. I am very proud to say that these are entirely hand made in the United States, from my original clay sculptures, to the finished bronze figures. They were officially registered with the Library of Congress on St. Patrick's Day March 17, 2014. Upon seeing them both for the first time, a friend, who is also a life long resident here exclaimed, "Paul, these are East Aurora". Exactly, and that was the very reason I made them. For me, they transcend the Village, the Roycroft, our memories, and symbolize what helped mold and shape a quality of life here, as well as our Head, Heart, and Hand. In this respect, I labored to make them the finest quality and want them to endure as heirlooms able to be passed down from generation to generation. They in turn, will last a very, very longtime. Connor was a self-taught artist who was highly regarded in the United States where many of his public works can be seen. 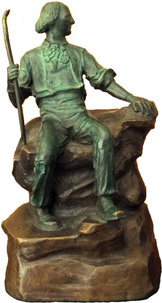 The original statue was sculpted in Ireland and cast in Philadelphia. It was created as a memorial to Hubbard after he and his wife perished in the sinking of the Lusitania. It was unveiled in East Aurora on June 19, 1930 Hubbard's birthday. Originally conceived as bookends, these figures are at 3/4" = 1'-0" scale. However, they most certainly can stand alone as fine art bronze sculpture. The standard base is green felt. Every bronze also comes with two interior welded thread mounts for optional bases, such as oak or marble. Patina is available in two colors. The one shown at left, matches the oxidation state of the existing statues. 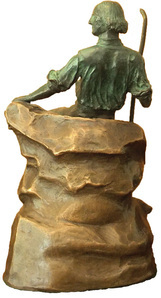 The other option is undertone is traditional bronze in color with green highlights. Please note, current lead time for new sculptures is about eight weeks.